While the jury might still be out on whether you can have a thin-and-light coupled with gaming prowess, over at MSI, it's pretty much business as usual. It's that kind of mantra that's produced the GT683DXR that lays before you, a rehash of the existing GT680 but with gussied-up internals, spearheaded by NVIDIA's GTX 570M. In our brief overview several weeks ago, we were impressed with its performance, but dismayed with its flimsy keyboard, possessed trackpad and general girthiness. So, were we completely off the mark? Or did our impressions change after spending a little more time coddled by its side? Join us in finding out, after the break. This gaming rig offers strong graphics performance and a crisp 1080p panel, but be prepared to settle for a frustrating trackpad and bendy keyboard. How would you rate the GT683DXR? There really isn't any way around it: the GT683DXR is a beefy piece of kit. Tipping the scales at 7.7 pounds and 1.77 inches thick, we'll leave it up to you to decide how "portable" this gaming rig truly is. The upside to all that heft is some sturdy construction -- save for its keyboard, which we'll dive into in a moment. The entire top shell is brandished in a smooth PS3-esque glossy plastic, which, as you'd expect, is quite the fingerprint magnet. It extends to the inside as well, where both the display bezel and keyboard deck are enveloped in the same element. In contrast, the palm rest is fashioned out of a less shiny (but still reflective) gray plastic that's etched with an attractive honeycomb pattern. Close the lid and turn the machine over, and you'll find the back brandished in a rougher grain of toy-like matte plastic, which, given that you won't be moving it around much, doesn't eke us out as much as it should. 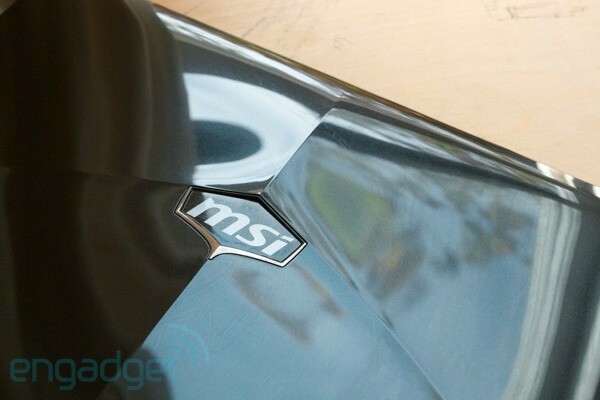 Given its footprint, we'd be surprised if MSI didn't include a bevy of connectivity, and thankfully it hasn't skimped. Starting around back, there's power, Ethernet, VGA, ESata and HDMI. The left side houses three USB ports (two of the 3.0 persuasion) and a card reader. On the right, there's a DVD burner (upgradable to Blu-ray), alongside another USB port and audio jacks (headphone, microphone, audio in and out). And, just like its forebear, its exterior is tricked out with orange LEDs. Two strips face you, from below the palm rest, while two more flank either side of the display with the fifth shining outward at the base of the top case. The more time we spent with the GT683DXR, the more we came to despise its keyboard and trackpad. While we have no qualms about the Chiclet layout or the plasticky finish, we found the underlying panel sorely lacking. Keypresses were met with a hollow noise, which, to be honest, reminds us of a first generation netbook, not a premium niche notebook. In particular, the racket emanates most audibly from the center of the panel and towards its left edge (especially near W, A, S and D keys). That's perhaps of little consequence to those of you planning on pairing the GT683DXR with a dedicated external keyboard, but we'd be remiss if we glossed over the fact that a $1,700 laptop got this wrong. And what an unfavorable thing to get wrong, as it's an oversight you're reminded of every single time you interact with the machine. Unfortunately, we don't have many nice things to say about the trackpad, either. It's passable, sure, but tracking was subpar, and prepare for repeated bouts of seemingly random jumpiness. Equally frustrating were the mouse buttons themselves, specifically where they actuate. They're most tactile in the left and right corners, and get increasingly rigid as you move toward the center, where presses become impossible. But at least unlike the dismal keyboard, you'll feel the trackpad's sting far less often, as -- let's face it -- how likely are you to frag sans external mouse? Onwards and upwards. 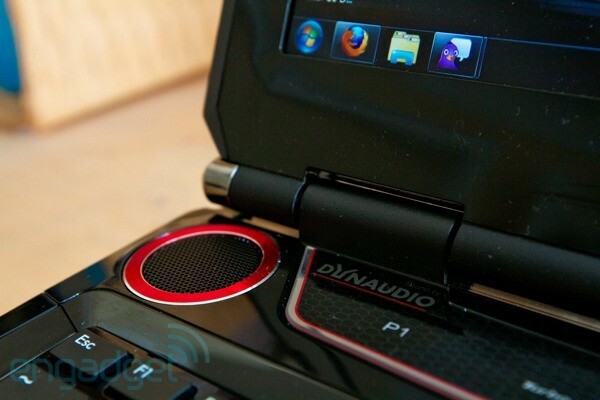 Unlike the GT683DXR's keyboard and trackpad, its display and speakers bring at least some reason to cheer. Beginning with the former, we found the 15-inch 1080p panel to be ripe with color and vividly sharp. We also had no qualms about it being glossy, as this panel isn't nearly as reflective as others we've tested. It is unfortunate that a glare-free option isn't available, even as an optional premium, as those dead set on avoiding glossy all together will have to spring for its matte-only 17-inch brother (GT783DXR). That said, viewing angles from the LED panel are excellent -- you'll notice minimal color distortion, even at severe side angles. The quality didn't seem as impressive when we experimented with different vertical angles, but it still falls squarely in the realm of acceptable. It's much the same story in the audio department as well. The Dynaudio supplied system was loud, and barely showed any signs of distortion -- even when we cranked it up to full volume. More bass would have been nice, but we're nitpicking -- we'd be hard pressed to find any laptop with deep enough low notes. 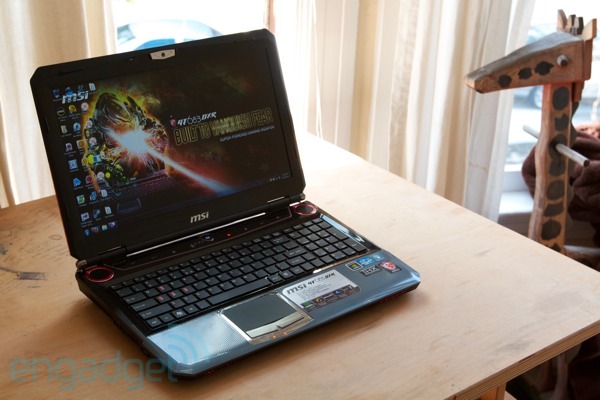 Performance from the Core i7-2630QM, 12GB of RAM and NVIDIA's GTX 570M beast was exemplary -- and don't forget, we're testing the base configuration. As you'd expect with a machine that scores 9,110 in PCMarkVantage11 and 16,862 in 3DMarkVantage06, games of Starcraft II, Portal and Half Life 2 ran at full resolution and maximum settings without a hitch. But with great performance often comes dismal battery life. So, how does the GT683DXR stack up? Pretty admirably, actually. In Engadget's standard battery test it lasted two hours and 40 minutes before succumbing to slumber. But more impressive to us were the two hours and 41 minutes we clocked while using it at full-brightness as our work computer. That means 20-30 browser tabs open including brief stints of Flash video coupled with some light Photoshop work and an IRC client. As for mobile gaming, we eked out one hour and 25 minutes of nonstop 2v2 Starcraft II matches before the machine called it quits. However, be forewarned that graphics performance is significantly hindered while untethered. So much so, that we had to turn down Starcraft II's graphics settings from "Ultra" to "Low" if we wanted to play while battery powered. Odds are that you won't be fragging on the go, but if want to intimidate your coworkers with an orange glow, its certainly up to the task. The GT683DXR is offered in two SKUs, priced at $1,699 and $1,849, respectively. While we tested the cheaper of the two, the only goodies the latter will bring are an additional 4GB of RAM (for a total of 16GB) and the addition of a Blu-ray burner. Otherwise either makes do with the same Core i7-2630QM CPU, a NVIDIA GTX 570M with 1.5GB of GDDR5 RAM and two 500GB hard drives paired in RAID 0. If you're looking for more acreage in a similar chassis, the company also sells the 17-inch GT780DXR. 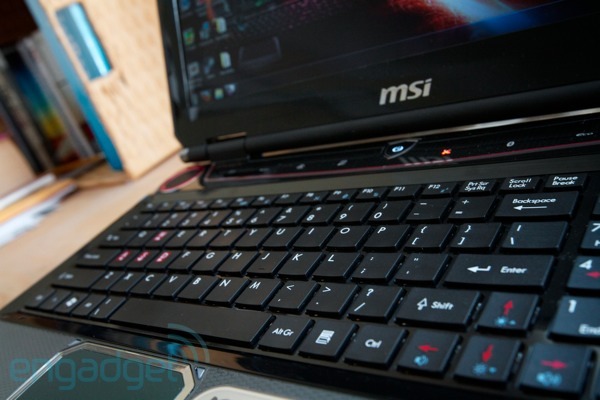 It, too, shares many of the specs of its smaller brethren, yet adds a matte display and a backlit keyboard. It's available in two SKUs -- one with a DVD burner and the other with a Blu-ray drive and 1.5TB HDD -- for $1,799 and $1,999, respectively. So how does the GT683DXR's stack up against others of its ilk? Turns out, pretty good actually. 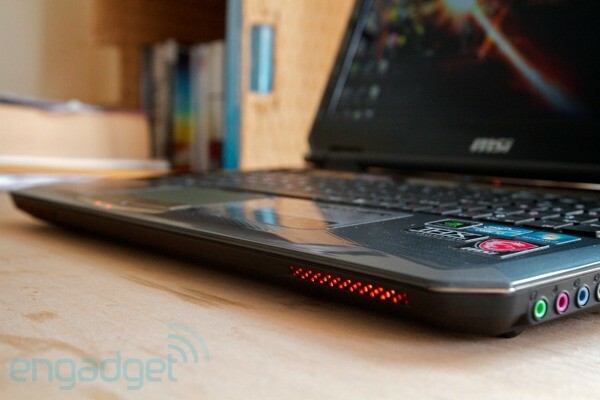 Take Alienware's m17x for example. 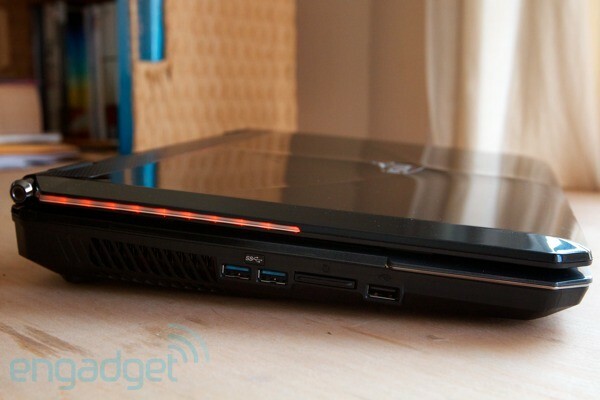 The $1,700 model gets you an extra two inches of screen real estate, but you'll have to cope with 8GB less of RAM, a single 750GB spinner and a lesser card in the form of NVIDIA's GTX 560M. Around the same price is the Toshiba's 15-inch Qosmio F755, but while it's 3D-enabled, it, too, comes up short with a paltry 6GB of RAM and a GeForce GT 540M. 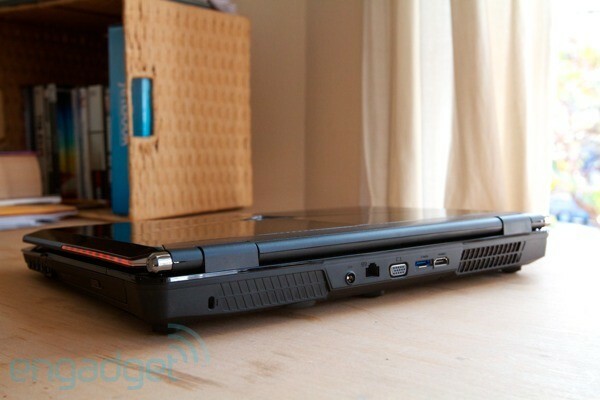 A fairer comparison would be its big brother, the 17-inch Qosmio X775 which has a GeForce GTX 560M and 1.25TB of storage, but again you'll find less RAM (8GB) and a higher price ($1,899). That leaves us with ASUS' G74. The 17-inch $1,799 laptop has the same 2630QM Core i7 and 12GB of RAM as our MSI, a little more storage at 1.5TB, but like the m17x makes do with a GTX 560M. It's more professional looking, sure, but given that the GT683DXR can be had for around $1,500, you'll have to decide whether or not its cleaner looks are worth the $200 premium. You know the idiom: if it ain't broke, don't fix it. Well, MSI, unfortunately some of it is broken, but by and large, the GT683DXR manages to pack quite a punch -- a surprisingly long lasting one at that -- and does it all for an admirable price. As with all things, there are niggles, sure, but when it comes down to it, you'll be hard-pressed to find more bang for your mobile gaming buck. Still, with just a little bit of tweaking, the overall experience could have been dramatically better -- but, we suppose there's always the next revision to look forward to. So, is it worth your hard earned cash? If you can get past its beastly grille, and don't mind lugging an eight-pounder, we say: yes.